This site is appreciably different from the StackOverflow site, in that most of the SO questions can be answered in text by way of an explanation. The illustration is code. On this site, some concepts are hard to explain in words. Maybe I'm talking about how to fix a leaky valve or don't even know the name of something around the house I'm looking to fix. In the same way, a picture is often worth a thousand words when explaining a how-to. I think we need to make it a lot easier to put images into a post. Most non-techies will not bother getting a flickr or other image hosting account to put up an image, or will not know how to copy the URL etc. I think it should be as easy as facebook to select an image and put it on the site. I know there are some obvious ramifications to this site, if we start hosting images, but I think this site in particular would benefit from more pics. Maybe we build in integration for flickr et al, so that the load doesn't end up on these servers? This is now implemented. See Jeff Atwood's blog post. The link "free image hosting?" links to a google search page listing image hosting sites. 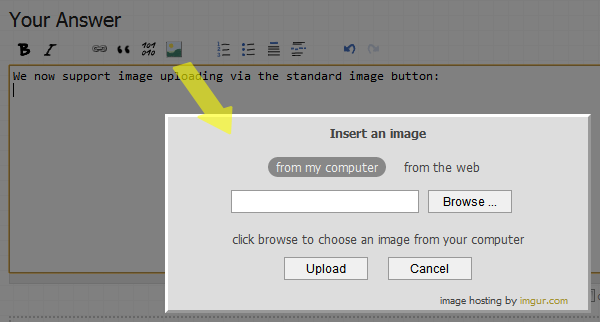 3 of the top 4 results (FreeImageHosting.net, ImageShack, TinyPic) allow uploading images without registering for an account, although starting an account allows for more advanced features, like managing your uploads, etc. I don't see the need to have this site or any other Stack Exchange sites manage uploads when there are already plenty of free, easy to use, hosts out there already. I think people who will have issues will be far and few between, and those that need help uploading images can be directed to an FAQ hosted here on meta.diy, or assisted through comments on the question.